If you are a blogger than you are very well aware of importance of Google Adsense in making money from your blog. It is either the major source of earning or some bloggers solely dependent on Adsense revenue. We already know that new bloggers face many obstructions and hindrances for being approved by Google and it is becoming more tougher with the time to get approved by adsense. Not only newbies but also established bloggers have fear of getting banned from Adsense . Sometimes Google even ban without giving any satisfactory reason. An even the outcome of appeal is not satisfy many times. Because of the discontentment and resentment of publishers who are banned without violating any policy, Google has come up with new changes and fresh system of the Adsense Program. Google has the largest Publishers and Advertisers base. Specially they are not able to provide support to all who do not have huge traffic and earning is very less. Also Google want only deserving site owners and publishers to make more with Adsense program. For all these reasons Google has decided to launch the Adsense Partnership Program, to help Publishers to grow their revenue so great extent. What is Adsense Certified Program ? In words of Google " Adsense Partnership Program is an invitation bases accreditation for business that consist of two main features- an account management solution to handle multiple accounts and an Adsense certification. Both account management solution and certification are exclusive to certified partners". Adsense certified partners not only setup and optimize but also maintain Adsense accounts for their clients. They are required to demonstrate their knowledge about Adsense by completing certification examination. Their main purpose is to help the website owners to monetize content effectively with Adsense. What Are the Benefits a Certified Partner Get as a Google Partner ? Establish a worth full business relationship with their clients. Maximize impact of their knowledge and expertise to help publishers and also grow their own business. Get Google Adsense Training also get Google Adsense Certified Badge. Use Google Adsense Client management system to work more efficiently. Establish relationship with Adsense team and get insight features. 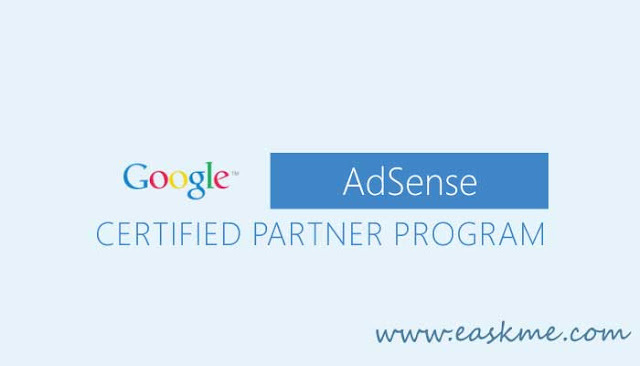 Gain exposure as certified Partner on the Google Adsense website. How to Become an Adsense Certified Partner ? Partners who agree to Google Adsense Online Certified Partner Program Terms and Condition are required to follow these policies, so read them carefully. If you fail to comply with their policies than they can revoke your certified Partner Status. Always check for updates. Its`s your own responsibility to keep yourself up to date and adhere policies. Partners must have an Adsense account and also prove their product knowledge in examination (learning material will be provided by Google). Partners are required to provide a real life Adsense case study or an Adsense acquisition proposal to show their proficiency. Google Adsense team will provide the template for this purpose. To Manage Clients, partners must use Google Adsense account management platform provided by Google Adsense team. Is some cases partners may not be able to use Adsense account management platform with a particular client. Google Adsense expects full transparency about a partner`s interaction with Adsense publisher. Partners will be managing ad units of client`s Adsense account. Partners must represent a good business and should be legally incorporated to do business locally. Partners must be part of AdSense publishers and for clients deliver high-touch AdSense optimization services. Partners must provide a business plan on optimization and acquisition of AdSense publishers that will serve as a performance indicator. The Google AdSense team will provide the template for this purpose. Partners need to have existing client base or strategy on how to grow AdSense client base. Partners need a sales power that is able to optimize and acquire Google AdSense publishers. Make sure that all sales representatives are Google AdSense certified. Must provide quarterly reports about their performance, including outreach activity and acquisitions, impact of AdSense optimizations with a business plan. AdSense team will provide a template for that purpose. Must differentiate AdSense services from other services that they are providing and use AdSense Certified Partner badge only on product or content related to AdSense. Must collaborate with the Google AdSense Certified Partner Team and in good competition with other Google AdSense Certified Partners. According to me these are the main reasons that made Google to launch this new program. This will help stop fraud adsense account openings. from now the Adsense certified team will get the new publishers their account approved from Adsense team. To help existing publishers to get support from Adsense certified partners. To Increase Publisher’s revenue by implementing various tests like A/B test, performing experiments with ad styles, locations, ad sizes. This will also help Google to grow it’s ad revenue from it’s adwords program. Google says, Collaborate with an external Google AdSense Certified Partner for a managed solution with additional services. These experts will help you optimizing AdSense revenue and managing account also enable you to focus on creation of up-to-date content. Their AdSense Certified Partners meet rigorous qualification standards and are carefully vetted and can assist you. Using AdSense on your website does not always mean that you are maximizing the potential of website. There is no criteria set by Google to join this program. But some Adsense partners have criteria like minimum page views. Publishers who have decent amount of organic traffic per month. Existing publishers who wish to manage their account and increase revenue from adsense. Publishers who can afford give some % of revenue share to adsense partners. Many of these partners create an Google Adexchange account for publishers. Some of the partners also provide Direct advertisers. Your revenue grows more than 50% with the same amount of traffic your. Some partners also offer support for hosting, SEO, IOS app development, Android, wordpress development etc. if you join an Adsense Certified partner chances of adsense account banned is very less as your partners always in touch with Google Adsense team for you. Also they try get Adsense premium accounts for their clients. How does Adsense Certified partners Charge and what is percentage Revenue share? The percentage share of the revenue depends upon respective partners and the services, Usually share be between 20-30%. How AdSense partner program beneficial even when you pay from revenue ? Your share is limited to adsense revenue. You also get Adexhcange revenue and Google Adexchange account. All extra income is yours. AdSense account is always safe with certified partners. Choose right partner. Joining this program is easy. Also you can leave anytime these partners. So there is no harm for going with AdSense partners also Google also recommends everyone to join Adsense partners.